This original Victorian parasol, with its unusual ogee-curved spokes, was found in a poor state of repair, its original silk covering and lining almost completely disintegrated. To make such an elegant artefact beautiful again, a sumptuous design using classical motifs was used. 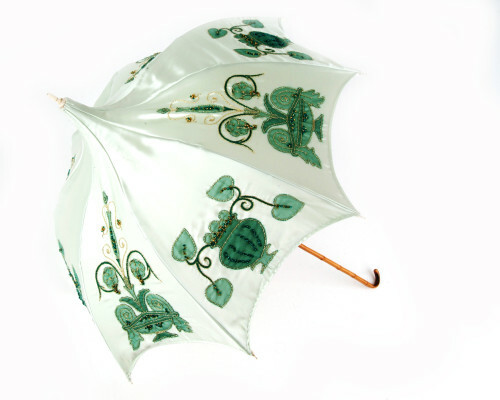 Two designs were used alternately over the eight panels of the parasol. They were inspired by photographs taken by Ruth of the original Burmantofts tiles in what was once the First Class waiting room at Newcastle Central Station, but is now the Centurion bar. The urns, leaves and flowers are completely hand embroidered, using chiffon appliqué, embellished with metal thread and split stitch surface embroidery and beading. Using what remained of the original cover as a template, the panels were custom made to fit, as was the lining hiding the spokes, made in cream silk crepe satin. Original early Victorian parasol frame, recovered with silk crepe satin ground, silk chiffon appliqué, metal thread and split stitch surface stitchery, and beading. Lined with silk crepe satin.